SIMODEL (Spatial Interaction Model; Williams and Fotheringham 1984) is implemented in Excel Macro. I have translated original SIMODEL which was developed by FORTRAN to Excel VBA and added some new features. 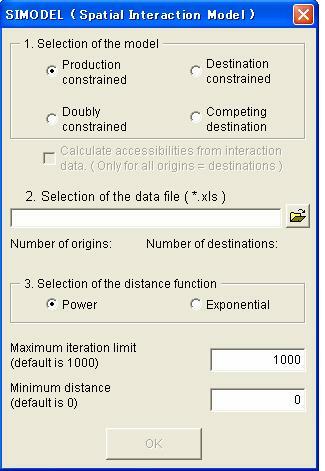 You can choose from Production constrained, Destination constrained, Doubly constrained and Competing Destination model. Please look downloaded Excel file for input data format and other uses. This entry was posted on 日曜日, 12月 24th, 2006 at 2:28 AM and is filed under Excelマクロ. You can follow any responses to this entry through the RSS 2.0 feed. You can leave a response, or trackback from your own site. © 2019 YabebeYa. All Rights Reserved.